Save costs with the latest 2017 discount code. Create and customize your own brand design and logo on a custom woven fabric label. We offer high quality woven labels, low minimum requirement and free UK delivery. Visit our website and click Facebook Page, and find the latest Woven Labels Discount Code on our Facebook Page. Perfect Labels-Lanyards are the UK based professional garment woven labels supplier. We provide professional knowledge and design layout advice related the design of garment labels. Contact our sales team on below email, we will take you through ordering your brand woven labels. You’ve spent a lot of time and thought designing your brand designer garments, and now you need the finishing touch. It’s important to select quality woven labels for your brand, as branding goes an awfully long way in influencing how your customer feels about your designer products. 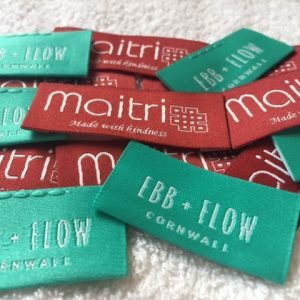 There are a few things to consider when deciding how to design woven fabric labels, and they are weave, colour, size and your company’s logo. Read more here. Perfect-Labels-Lanyards is a leading UK-based Labelling company with over twenty years experiences in supplying fashion branding garment labels. We provide comprehensive advice and professional labelling consultation that are related to the design of woven garment labels with a quality reflecting our customers’ brand image and corporate culture. This enables us to build a long-term, strong bond and positive partnership with all our customers. We supply woven fabric labels to many of the UK’s largest brand name companies.